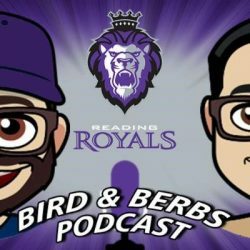 The Reading Royals, ECHL affiliate of the Philadelphia Flyers and Lehigh Valley Phantoms, have announced that the team will launch the “Bird and Berbs Podcast,” with the first episode coming out this week. The podcast will be hosted by Royals Equipment Manager Jason “J Bird” MacDonald and Sean “Berbs” Berberich. The show will take an inside-the-locker-room look at the Royals as they prepare for the 2018-19 season. Voice of the Royals David Fine will also be a contributor to the show. Fans can listen to the show on Apple Podcasts, Google Play and through links shared on Royals social media. MacDonald is entering his fourth season as the Royals Equipment Manager and has worked in hockey operations for 18 years. The Detroit, MI native was an assistant equipment manager with the NHL’s Florida Panthers from 2009-14. Prior to that, he was Head Equipment Manager for the Florida Everblades from 2006-09 and helped the team to the Brabham Cup in 2008-09. His ECHL teams have made the playoffs all six seasons he has been the head equipment manager. Berberich starts his third season with the Royals in 2018-19. Before his time with Reading, Berberich was an athletic trainer with the Evansville Icemen. He also has hockey experience with the Washington Capitals and Charlotte Checkers. The Longwood University graduate has a master’s degree in Exercise Science and Health Promotion with a specialty in Performance Enhancement and Injury Prevention. Season tickets and mini-plans are on sale by calling 610-898-7825 (PUCK). The Royals will open the 2018-19 regular season at Santander Arena on Sat., Oct. 13 at 7:00 p.m. vs. the Worcester Railers. The home opener will feature a special Block Party and “Red Carpet” presentation for the team.